Where to begin…I guess I’ll pick up where I left off. 12 weeks pregnant. Everything went smoothly during the pregnancy (mostly). We found out we were having twin boys! As time went on the more I was reassured everything was going to be okay, though I still had my moments of panic as I think most pregnant women do. I did yoga until about 6 months and walked through the park up until around 7 months. Around 8 months everything started to go a little downhill. The boys were growing bigger than most twins and I was putting on a lot of weight (mostly water). I was 75 pounds heavier and starting to have trouble walking. I had severe edema and my blood pressure was spiking beyond the range of normal. But because I lacked the specific amount of protein in my urine they weren’t quite calling it preeclampsia just yet. I started to make frequent trips to the hospital at this point with either severe pains (from how large I was getting) or high blood pressure and dizziness. Every time, they sent me home with instructions to keep checking my blood pressure at home. I was miserable! After 4 trips to the labor and delivery unit my blood pressure finally spiked to a whopping 160/130 and we made our last trip to the L&D. At 36 weeks and 6 days they decided enough was enough and they were going to take the babies. At this point we had a choice, try for a vaginal delivery or go with a c-section. A vaginal delivery was safer for me but could put baby b in danger as sometimes the second baby can get caught in the birthing canal. A c-section was safer for babies but put me at risk. We opted for a vaginal delivery just so I could try and experience a somewhat normal delivery with the boys. Truth be told I was scared to death of a c-section. I dilated to 6 immediately after all the fun of inducing but sadly after nearly 24 hours it did not progress from there. I was over it! And I told my doc. same. Within minutes we had 10 people in our room prepping us for a c-section. Sponge bathing me, getting Justin ready, it was probably the scariest, and at the same time, the most exciting moment of our lives. The look of terror and excitement on Justin’s face is probably not a look I’ll ever see again but one I’ll never forget. Now they say c-sections don’t hurt and maybe in a sense they don’t hurt as in specific localized pain. But the tugging and pulling of my insides as they’re pushing aside organs and pulling out each baby is not exactly a pleasant one. I’d say it hurts for sure. I now have a deep respect for all women who go through this. The fact that I haven’t heard one of my friends complain is amazing! And maybe it was the fact that there was two in there, but I’ll forever complain about my c-section. We’re definitely the happiest parents on earth! Immediately after delivery my oxygen level dropped and I had to have two blood transfusions. One right after and one the next day. Apparently this can be common with a twin c-section. It took a few days for me to get my strength and breath back and there was a time I was afraid to go to sleep thinking I wouldn’t wake back up (I’m a bit dramatic like that sometimes). 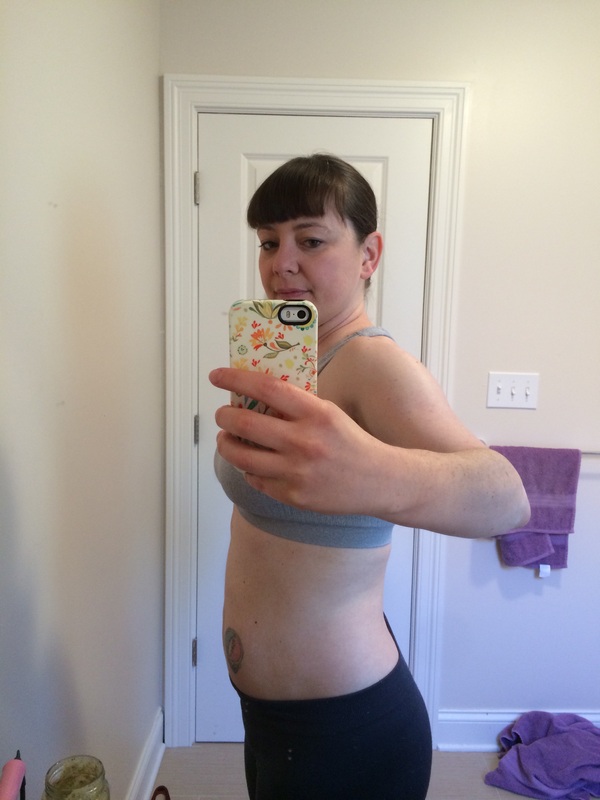 Aside from that though postpartum recovery was pretty easy. The thing no one tells you is that with a c-section you’re mostly numb so the pain is pretty much non-existent. I’m sure everyone has a different experience but for me, I was up and walking right away. I was out running errands and taking walks with the boys within 2 weeks. I’ll try to keep this post from running on and on. I could keep going about my experience but I think I will break up our experience into other, shorter posts. Who has time to read all this anyway? The next 8 weeks was probably the hardest of my life. Twins are seriously no joke but more on that some other time. For now I’m off to work off this 4 month post postpartum belly. Until next time here’s a current picture of the boys at 4 months! This entry was posted in Babies and tagged c-section, preeclampsia, twin delivery on February 7, 2017 by katiebird. Just a little update…Yesterday was our 1st trimester bun screen and the babies are healthy and both measuring on time. We saw them moving around and their little hearts beating around 167 bpm. Is this seriously happening? Twins? I never thought we’d get here to be honest. I can’t tell you how many times I thought for sure I messed something up and that I would get devastating news at the docs office (so ridiculous). Of course each ultrasound has proven me wrong. I’m about a week away from entering the 2nd trimester and I can’t wait! I’m already feeling less nauseous, less trips to the bathroom, and a little less sleepy? Okay, maybe not less sleepy but I’ve always loved napping so honestly I don’t mind. I’ve started prenatal yoga and I love it. It’s making me strong albeit sore and I’m hoping it’ll help with future aches and pains. And at the rate my belly is growing I think it’ll help sooner rather than later. I’m showing like I’m closer to 20 weeks. Eek! 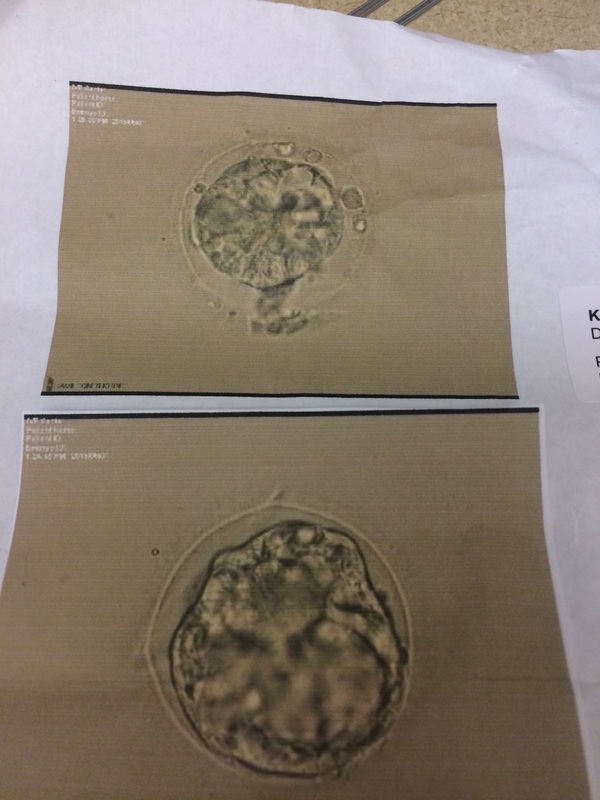 This entry was posted in Fertility and tagged 12w, fertility, ivf, twins on April 14, 2016 by katiebird. Hi! Surprised to see a post from me? I am too to be honest. I’ve debated about posting for awhile. I did exactly what I set out not to do which is let a lot of dust collect in this little space. But I’ve really had nothing to update for some time. We took some time off of IVF and just lived our lives for a bit. To be honest it was a little liberating not waiting for the next cycle. We joined races, hiked, canoed, camped, and just enjoyed each other’s company. It was probably one of the best summers I’ve had in years. But I’ll get to the point..after taking some time off we decided we aren’t getting any younger and it was time to try again. We switched doctors and did another two rounds of IVF. The first didn’t work and to be honest I wasn’t surprised. Since we have started this journey almost 3 years ago, every other cycle has been negative. It was time for a negative. As disappointing as it was we wanted to move straight into another cycle. We were determined and luckily the new clinic lets you start right away. So we began our 6th cycle shortly after. Now I think it’s important to mention it was our 6th cycle because of this article. It goes on to say 65% of couples will find success after 6 cycles. Sadly, most couples either can’t or won’t continue after the first try. We also decided, for the first time, to try acupuncture with our cycle. My previous clinic was against acupuncture for whatever reason but the new clinic was completely for it! There’s a study that has found acupuncture can increase your chances by almost 20% which you can read about here. While it was a little on the pricey side we thought it would be worth it if it worked. Because that right there, friends is our twins! We’re still completely nervous but it’s slowly setting in that we may finally be having a baby babies. Tomorrow I will be officially 9 weeks and I’m just trying to take it one day at a time. We’ve been through so much that I can’t help but think the worst sometimes. Will this get taken away? Another devastation? So far they’re healthy, measuring right on time, and we’ve confirmed both strong heartbeats. I have mild morning sickness and I am so exhausted that I nap as soon as I get home from work and then go back to bed only 2 hours later. This pregnancy is definitely real and I take some solace in that. I just hope that I can soon enjoy this pregnancy as much as a normal pregnancy without fear constantly creeping in. So that’s the big news and we’re completely excited. I can’t wait until we can shout it from the roof tops and let the world know, but until we reach our 2nd trimester I will be holding my breath. This entry was posted in Fertility and tagged fertility, FET, infertility, ivf, twins on March 18, 2016 by katiebird. Ugh, anyone feel me on this? Every time another round of IVF comes up I cringe. Another 5 pounds to add to my already growing overweight frame. My nurse told me the hormones don’t make you gain weight so that only makes me feel worse. I’ve tried eating healthy, not overeating and exercising throughout the process and when all is said and done it’s another 5 pounds on the scale either way. 4 rounds = 20 additional pounds and I hate it. Of course it’s harder to lose than before. I’m 37 now and even though all your life you hear the “you’re getting older” bit I always thought I would be exempt. Ya know? Because duh, I’m not like everyone else. Besides running we’ve been staying pretty busy. It’s helped to stay busy so I’m not sitting around reading everyone’s pregnancy announcement, or birth announcements or getting updates on my friend’s babies. I like the updates but I just can’t with that right now. Someday I’ll be in a better place, but it’s not now. So, I want to do as much hiking, biking and running as our weekends allow as well as make plans with friends and visit all the breweries we haven’t been to (and there are a lot here in Chicago). We’ll see how far we go but so far we’re already ahead of last year. 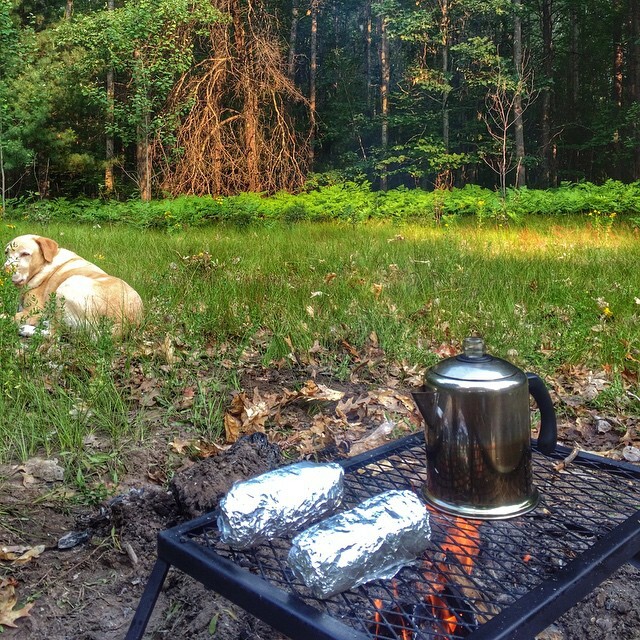 And I finally got that camping trip I’ve been dying for…. 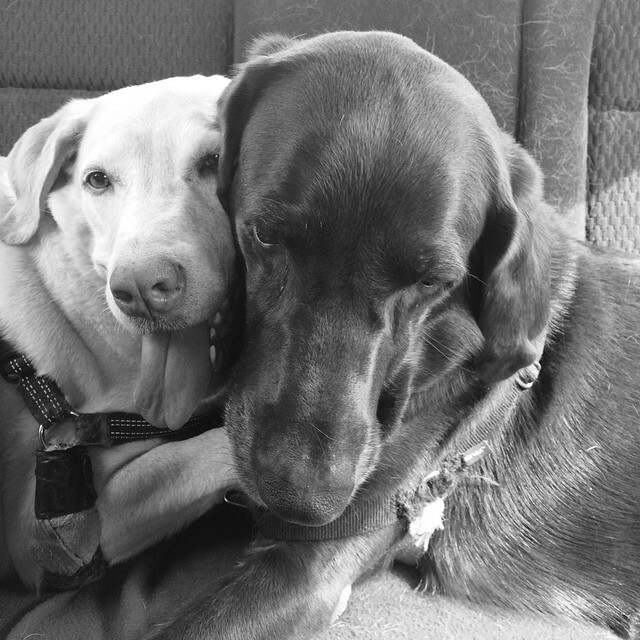 I worried about the dogs on such a long trip. 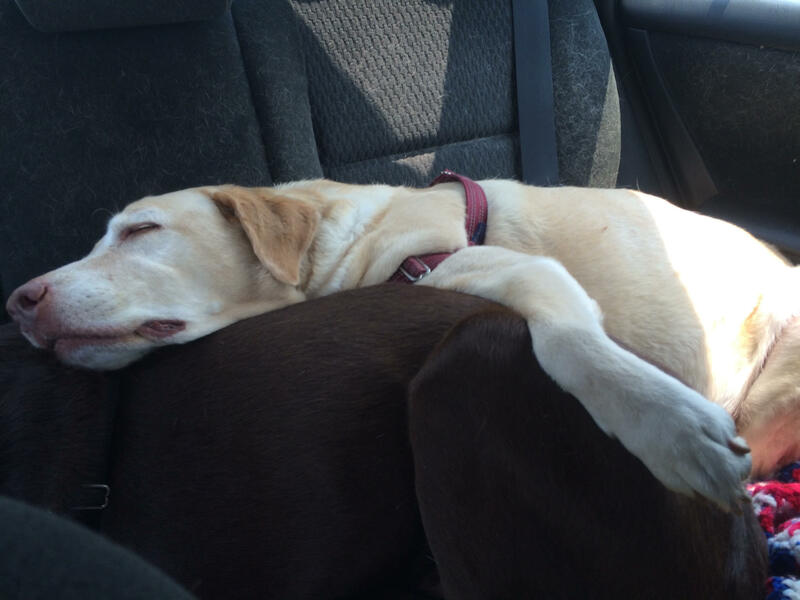 We drove 4.5 hours to Michigan to camp and it was the longest ride they’ve been on. Let’s just say we’ll keep it closer to home next time. 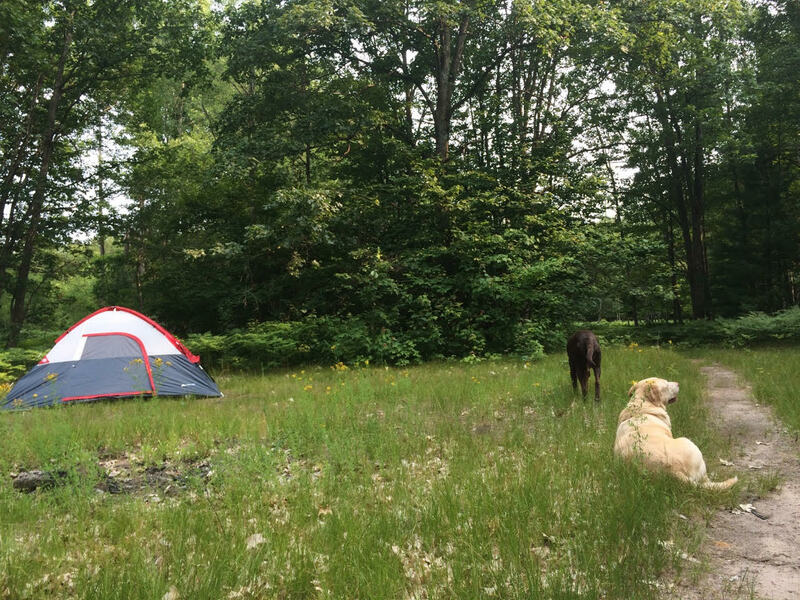 We drove to Michigan with no particular spot in mind, picked the first untraveled road we could find and found a nice secluded spot away from other campsites. Patience is needed for this but it all worked out. Love to all my family and friends! 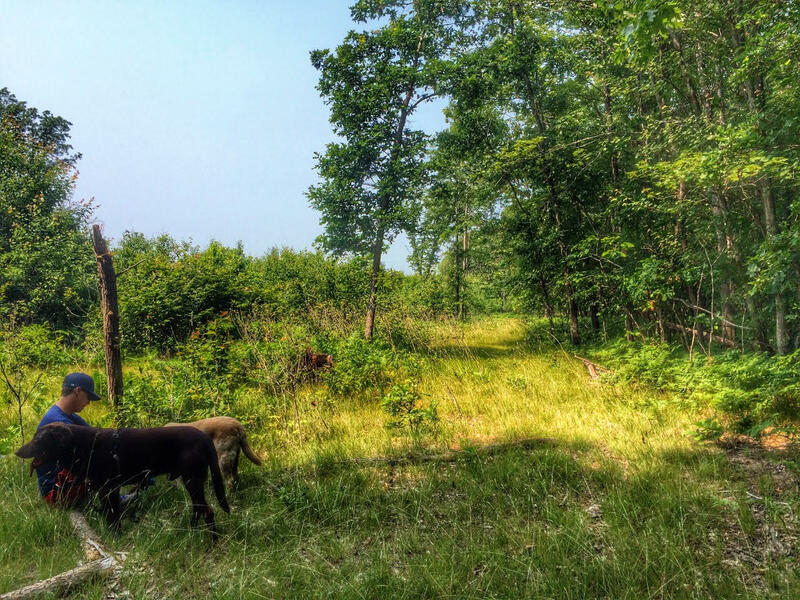 This entry was posted in What we did... and tagged 5k, camping, fertility weight, manistee forest, Michigan Camping on July 14, 2015 by katiebird. Weird to be excited about that right? But I am. My hcg levels are officially undetectable and that’s a good thing. That means no more poison shots and no surgery. Also, it means we can move on with our life and resume some normalcy. So we did. 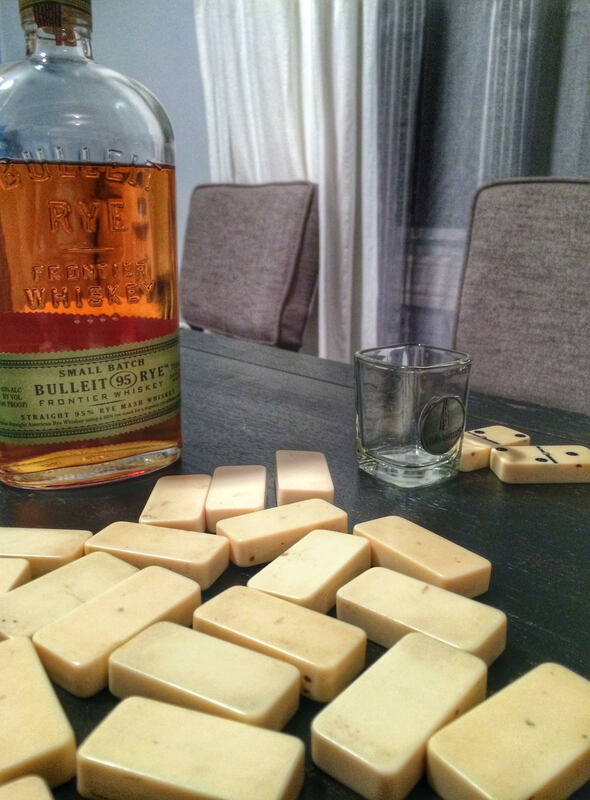 A whole lot of dominos and shots went on recently and damn it felt good even though I lost every single game (but I’m pretty sure Justin took full advantage of me). Normally, I’m the winner. I swear I am. With that said I think this next round, whenever that may be because we have to wait for the poison to leave my body (at least 3 months) and decide when we’re ready, we’ll be keeping it to ourselves. No blogging it, no telling family members, just something for us this time. Don’t get me wrong I loved blogging about it this last time, even in the dark times it was pretty great to have this as an outlet for my feelings but we’ve also never kept it to ourselves completely and there’s something so intimate about that (or maybe I’m just being superstitious). For now it feels good to feel normal. I’m still not allowed full exercise (grr) but walking has been given the okay and so a whole lot of hiking will be going down in these next few weeks and hopefully a camping trip soon? And by camping I don’t mean “glamping” whatever the hell that means, I mean straight fishing, tent, grill, hiking, bug spray, sleeping bags, a whole lot of beers, no showering kind of camping. Yeah, that needs to happen. This entry was posted in Fertility and tagged fertility, infertility, interstitial ectopic pregnancy, ivf on June 12, 2015 by katiebird. Well it’s been a week since my last post so I thought I’d check in. I really have no motivation to write but if I don’t write now I’m not sure I’ll ever be back to write again so here goes.. I was able to skip surgery and move on with a shot of methotrexate. Not a fun shot at all and as I write I feel quite depleted of all nutrients. For those that don’t know methotrexate is usually used to treat certain types of cancers and is used for chemotherapy so that should give you an idea as to how I’m feeling. Tired, thirsty and like I want to gobble a handful of vitamins. It’s pretty yuck. I have to follow up with the doctor for constant reminding that I’m no longer pregnant and the kicker is I’m being treated by my obgyn so it’s real fun sitting in his office watching all the happy pregnant women come and go. 😦 We’re hoping my level goes down to 0. Currently it’s at 14 so I’m well on my way and I’ll have another test again Thursday. It’s sad how one week I was hoping for high numbers and the next I’m hoping for low. But the lower the number the less risk I have of hemorrhaging. Pretty scary stuff. A few days after I was trying to forget about the ectopic I received an email from the laboratory with my results from the ultrasound. I was curious and for some reason thought it was a good idea to read in detail of the ectopic. It turns out I was pregnant with twins. And just when I thought it couldn’t get any worse. Apparently they both had lodged into the corner of my uterus which is called interstitial ectopic. Both? Can we just talk about this for a minute? I mean, I can understand one moving it’s way there by accident but both just accidentally wiggled their way over there? My theory (if anyone really cares to hear it) seems to be either they were placed to high in the uterus or they were pushed with too much fluid. After some quick research I found that both are likely the cause for multiple ectopics with IVF (this is my 2nd). So there it is. All the thoughts I’ve been having and dealing with in the last few days. Thankfully, I’ve had family in town and a daughter to celebrate graduation with so honestly I’ve been in pretty good company and spirits. Tonight is my first night to myself and I am looking forward to it. A little quiet time with my pups and a nice hot bath with a book sounds like the perfect evening. This entry was posted in Fertility and tagged ectopic, fertility, infertility, interstitial ectopic pregnancy, ivf, methotrexate on June 3, 2015 by katiebird. Our 6w4d checkup turned into my worst fears, worse than a miscarriage (though don’t get me wrong that’s up there for worst fear as well). Our baby embryo (because it didn’t quite make it to baby status) has found its warm and snuggly place in the corner of my uterus and just outside, where a pregnancy cannot be supported. In other words this is now our second ectopic pregnancy. As I speak write I have about 2 doctors and 2 radiologists discussing the best option for ending this nightmare. I’ll either be given a shot of methotrexate (a drug commonly used for chemo therapy) or we will have to proceed with surgery in the next day or two. Obviously, I’m hoping for the first option. Another surgery is not what I had in mind (none of this really is though) and being that it’s Katrina’s graduation weekend and we have family in town, it’s not exactly ideal. So as I wait for how we will proceed I’m sadly packing away my pregnancy books (that I just had to have this week) and the maternity clothes that arrived by mail just this morning (a total kick in the face). Sadly, this is all too familiar. We’ve been through this once before and while I shed a few tears this morning I now sit here pretty sober. I don’t have time for grief. I need to be strong for my husband and family who I feel I have let down. I need to be strong for my daughter who we’re celebrating all her hard work. I can’t really grieve what never was, all I can do is remain positive, think of the future and next time (and there WILL be a next time) and just move forward. Because that’s life right? 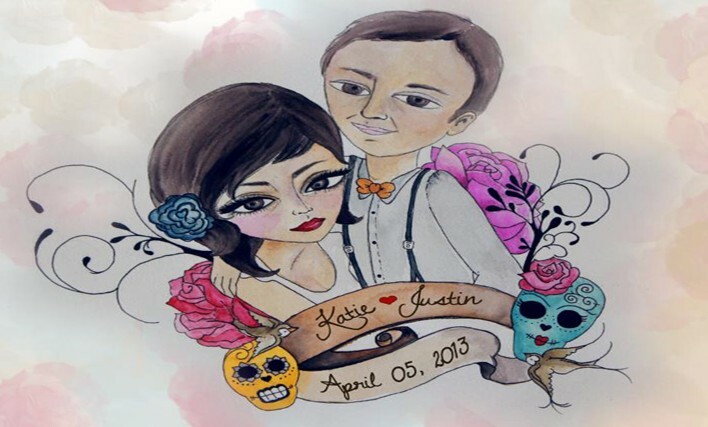 This entry was posted in Fertility and tagged ectopic pregnancy, fertility, infertility, ivf, ivf ectopic on May 27, 2015 by katiebird. Weird right? How weird will it be to show my kid/s when they are older and tell them that this is them?! Also, do we get both or just one? We find out next week. Seriously can’t wait! Here’s my first “belly” pic though not much of a belly yet. This entry was posted in Fertility and tagged 5 weeks, fertility, ivf, mother of dragons, pregnancy on May 19, 2015 by katiebird. It’s official! This little baby (babies?) is growing inside my belly perfectly so far. Our beta number has doubled to 580. I’m over the moon! I had a good feeling (with all the symptoms that are coming on stronger each day) but at the same time I needed to hear it. We didn’t make it this far the last time we got a positive a year and a half ago and so the reality of us having a baby of our own is finally sinking in and it feels so good! Next up is an ultrasound on May 27th and I’ll be 6w3d at that point. The hurdles we have to overcome are now starting to shrink and seem almost non-existent. Nothing but pure happiness over here guys. 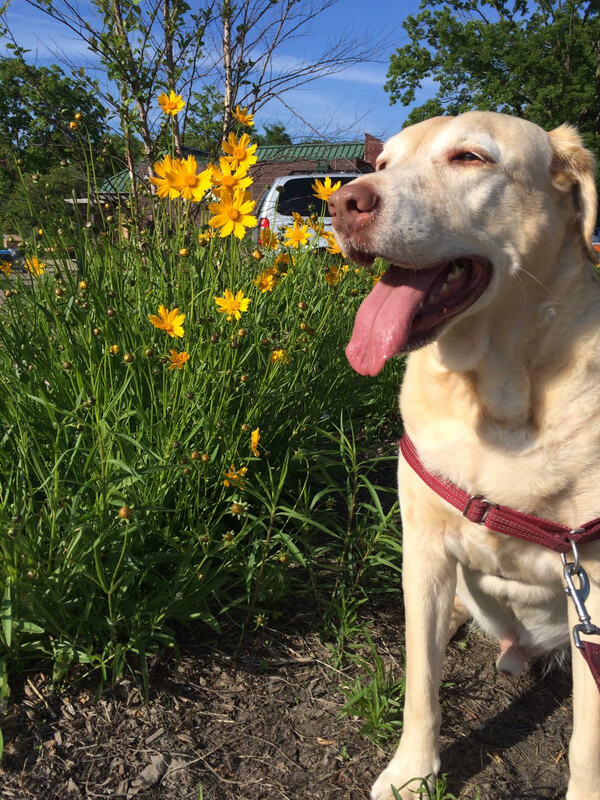 This entry was posted in Fertility and tagged beta, fertility, infertility, ivf on May 13, 2015 by katiebird. Beta pregnancy test results are in and…. WE’RE PREGNANT!!! I just got the call from the nurse that my beta number is 283! We are beyond ecstatic as I’m sure you can imagine. 2 years of trying, 4 IVF cycles, and 1 heterotopic pregnancy and we have finally received some good news! And I have a little confession to make..we actually found out yesterday. We’re still not in the clear though. This is a great first step and if all goes well we’re on our way to a successful pregnancy but we have more steps to overcome. First, we have to return in two days to make sure my HCG levels are doubling, this is standard though and there’s really nothing to worry about and no reason to think the numbers won’t double. Positivity people! After that we go in for an ultrasound to make sure there’s a heartbeat. From there I’ll eventually get released to my OBGYN and slowly weened off the hormones while my body starts to produce it’s own. Anything can happen between now and then so all I can do is remain positive and take care of myself the best that I can. Worrying won’t make anything easier or better. For our friends and family: I’m going to continue to document our progress here but we won’t be making any official announcements until sometime between 14-20 weeks. Depending how comfortable we feel at that time. In case, god forbid, something should happen during this pregnancy the less people that know the better. As silly as it sounds being that I’m here announcing it to anyone who stumbles upon this space of ours, we’d like for our close friends and family to keep it a secret…for now. 😉 If that makes any sense at all. So that’s all I have for now. I’ll be back on Wednesday morning to confirm that our beta number is doubling. 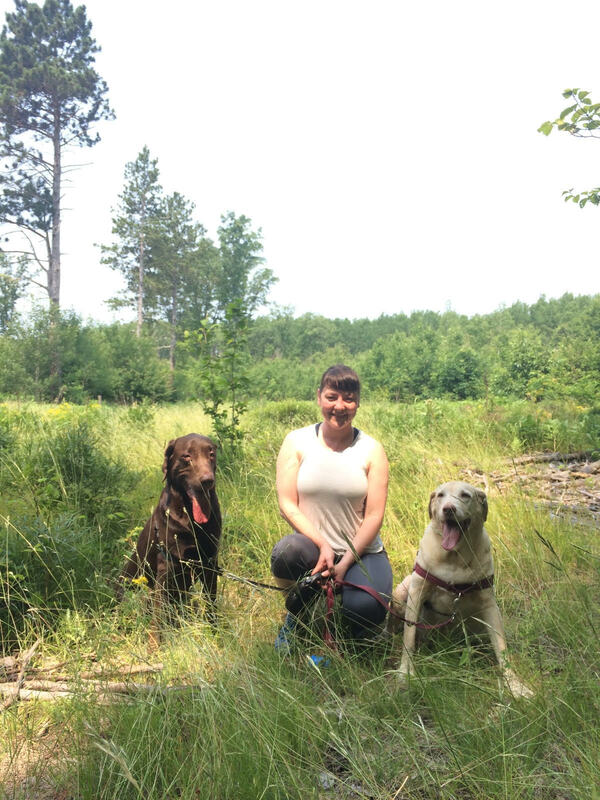 This entry was posted in Fertility and tagged BETA TEST, fertility, infertility, ivf on May 11, 2015 by katiebird.